I've been experimenting with crocheted edgings for one of my new patterns. I wanted something simple, sweet, and small, and my beloved Creative Hands series delivered - chapter 10 of the crochet section is entitled "Trimmings and borders galore"! So far, this edging is my favorite - it doesn't constrict the natural stretchiness of the knitted fabric, and is decorative but doesn't look overly lacy. It's just a nice little edge. It's so enjoyable to crochet this picot edging that I kind of want to put it on everything I own. Again, from Creative Hands: "Nearly everything in your linen closet can be given a different look with crochet edging in fine cotton." Indeed. It's completely addictive, and super quick. Here's the pattern I used - it's called "small picot edging" - you can either do a free-standing trim to sew to something, or you can crochet the edging into an existing piece of fabric (woven, knitted, or crocheted). I'm going to write it out in plain English because for some reason crochet abbreviations make my head hurt. Single crochet into the edge of your fabric. Chain 3, single crochet twice into the first chain. Now just single crochet into the fabric again (I skipped one knit stitch on edge of the fabric) and continue with pattern. I used an E hook (aka sz 4, aka 3.5mm) and worsted weight yarn. Easy peasy. Chain 3, work 2 single crochets into the first of the three chains, repeat. Wow! In other crochet news, I was so impressed by Monster Crochet's filet crochet skeleton antimacassar. Filet crochet has such a lovely, old-fashioned look to it, and antimacassars are pretty much the height of Victorian fussiness - I love how she coupled that with such an unconventional symbol. And yet the Victorians themselves were obsessed with death - it all comes together. It's just so perfect! Lastly, possibly the best job opportunity/living situation of all time. I am so tempted! Lastly lastly, for reals, I turned on the word verification setting on the comments, due to spam. Spam makes me glum. You can get your own Tania coloring book here. I'm kind of embarassed to admit that I'm keeping it for myself. I love it, the illustrations are so clever and funny and sweet. I was a huge coloring book fanatic as a kid. I just recently remembered that I went through this weird coloring phase in second grade; I wouldn't color the entire area inside the black lines, only a very defined, 1/8 inch area right next to the line. I thought it looked incredibly sophisticated; I now realize it was a little uptight of me - we were moving from Guam to California halfway through the school year, perhaps I needed to exercise a little control over my environment! Tania was nice enough to include a vintage Mary Maxim knitting booklet with my order, and if you think I'm not going to knit this hat to keep my head warm this winter, you are SORELY mistaken. Thanks Tania! And look at all the amazing colors it comes in. The tote is by koziol, a German company that sells just about every kind of well-designed plastic thing you could want. I would love to have one of these too, but they've been discontinued. Bummer. Like the spider print? I thought it was appropriate for a knitting bag. I made it when I learned to knit the first time, about 6 years ago. It has a drawstring so I can open it and knit, then close it when I have to go on about my business. San Francisco residents can visit karikter, on Sutter, to get koziol stuff, and if you want to get me one of these while you're there, that would be great. Thanks. Speaking of knitting (do I ever speak about anything else? ), Alice made a super stylin' bunny from my pattern. I love the little sundress and the amazing colors. 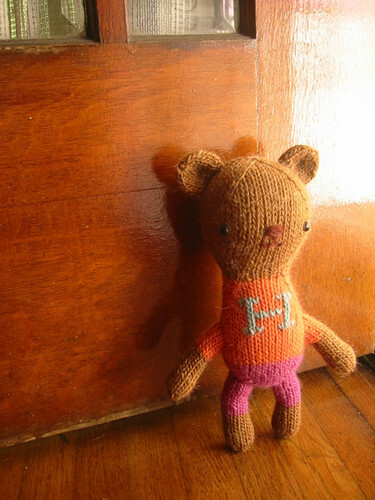 Here is Henry the bear; I have been known to refer to him as "Henri" or "Hank". I am so pleased with how he turned out, I knitted his head and body together as one piece. A pattern for Henry will be in the booklet (can I call it a booklette?). *I get my safety eyes from CR's Crafts. They say they have the "Largest variety of doll and bear supplies ANYWHERE!" and I'm inclined to believe them. They have every kind of doll and bear eye in every size and color. Including black 9mm, the ones I use most often. You can buy them in bulk or in smaller sets (of 6 or so), but the bulk ones are so cheap I buy 'em by the hundred. *Lamb's Pride Worsted by Brown Sheep is my toy knitting yarn of choice. They have an incredible range of colors, and I love that the resulting fabric is firm (it holds the shape of the toy well) but still very squishy. And the 15% mohair content makes for a very fuzzy doll. Fab. 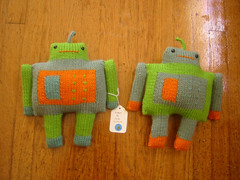 *A few months after I learned to knit, I decided that I really wanted to try making some toys. 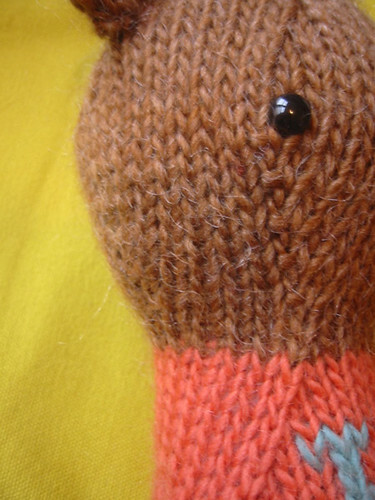 I looked far and wide for toy knitting books and found World of Knitted Toys by Kath Dalmeny. There are some really amazing patterns for dolls and (realistic-looking) animals in there, it's where I learned that if you increase and decrease regularly over many rows, you can make all kinds of odd shapes. I think that's when I decided that Knitting is Pretty Darn Cool. Thanks Ms. Dalmeny! 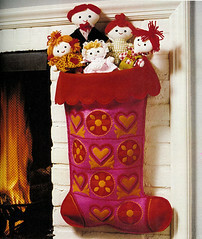 *There's a toy pattern in the new knitty, check it out! Thanks for the friendly and supportive comments. Hillary wrote about a revelation she had the other day while looking at Angela Moll's Secret Diary quilts - about showing only glimmers of oneself and one's life in a blog. Sometimes I feel like having a blog is like keeping the door open just a little, just a sliver - here's my crafts, I went here, look what I bought - when in reality things are so much more messy than that in life. More complicated, with worries and stresses and private joys and all of those daily human things. I guess I open the door a little more or less with every post, as we all do. Yesterday, a little more than usual! 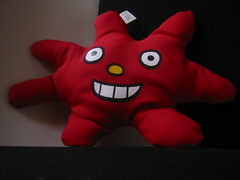 I was looking for images of old stuffed animals and found this one here. I love material culture, our things say so much about us, and we imbue them with so much meaning. And can any object have more significance to us than an vigorously loved toy? These guys are so sweet and sad. Beautiful. Friends of Pee-Wee's Big Adventure will surely appreciate the reference. I am swimming in a multi-colored sea of yarn and daydreaming about color combinations. 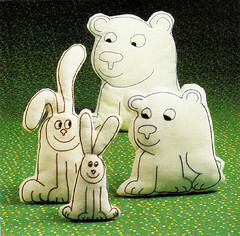 And I am a bit overwhelmed, not with the work of getting the pattern booklet together, but with other things. 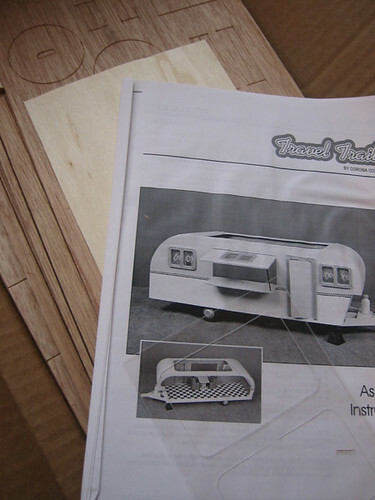 Until recently (ie, starting this blog), I never showed the fruits of my creative labors to anyone except friends and family, and then only very infrequently. And now here I am, all "lookit lookit". There's a sort of worry that comes with this, I find, wondering if my stuff is good enough or smart enough, and if goshdarnit people like it, but I have to say, it's so much better than the alternative. This guy is unfinished, and is therefore mostly out of frame... I was just so satisfied with the lurvely curve of the increases and decreases. Hot cha! Yikes. Off to buy the wood glue... and some teeny tiny lawn flamingos. 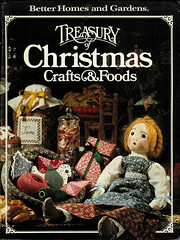 As I've mentioned before, finding a good vintage craft book at a thrift store or flea market makes me do the happy dance. So you can imagine how excited I was to get a vintage craft book in the mail the other day, from my mom - one she bought new in 1980! 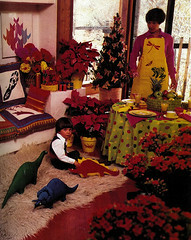 I loved this book as a kid, it wasn't truly Christmas unless I'd looked through it about a million times. Even after I left home to go to college, trips back for the holidays always involved a little time spent with the Treasury. Funny how that works. A lot of the stuff in it seems dated (of course) but looking at it now, 25 years later, I can see how much it influenced my crafty aesthetic and inspired me to make toys and other fun stuff. Got this fellow a few months ago from DAVe Warnke. I've seen his stickers up all over SF for years, and they always made me happy - I mean, look at those faces! Even on a crowded muni train, seeing one of those guys makes me feel like everything's going to be a-okay. I stumbled across his flickr photos and immediately recognized his work (hooray for flickr), and his flickr profile led me to his site, which led me to his dolls, which seem to be 3D representations of his strange and funny characters. I had to have one, of course, because I'm in an art toy acquisition phase. He puts these toys up for auction on ebay, and sells all sorts of other stuff. 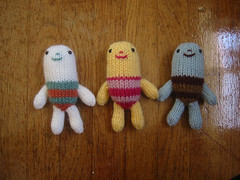 Here are some toys I knitted recently, all commissions. I love playing around with colors and faces, it's so fun to see how they turn out. I enjoy reading the stories that folks write about their creations, Kath Red's puppets for example, and Hillary's super sweet story about Paige the kitten, and of course Jane at Yarnstorm's lovely dolls. I sometimes consider doing something similar for my guys but always come up blank - creative writing was never my strength! So I guess I can only hope that the folks who get my toys will make up their own stories about them. 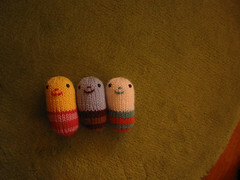 I'm working on patterns for the leetle book, and watching the news, and just feeling rather glum. I'm having a hard time wrapping my brain around the scale of this tragedy; my heart and mind goes out to all the folks who have been affected. It has got me thinking about my family, and how much they mean to me. I come from a long line of crafters and I'd like to share a bit about them with you. My Mom makes gorgeous quilts and gives almost all of them away. She learned to sew when she was young and sewed most of her clothes as a teenager. She started quilting several years ago and I always love to see what she's come up with - and she loves the mathy parts about it, can you imagine? My sister Kate is one of the most talented people I've ever known. She hand-pieced an extraordinary Grandma's Flower Garden quilt, and is quilting it now. I love it. She made me a wonderful embroidered quilt and knits and crochets and beads and does pretty much everything. Grandma Leota teaches folks how to weave baskets. She lives in Southeastern Ohio, in the foothills of the Appalachians, and has a farm and a workshop filled with all her dried flowers and basket supplies. She is well into her seventies and still hikes and bikes and gardens. Her Mom, Oleanno, and another great-grandma, Gladys, both quilted. I have one of Oleanno's and it's comprised mostly of scraps from sewing clothes - I love it. Gladys did quilts from kits well into her eighties and nineties, they are really colorful and gorgeous. And so on and so forth. When I think of all the folks in my family - over generations and generations - who have made things with their hands, either for fun or out of necessity, I feel part of something very big and important. People in my family have been farmers and laborers for generations, hand-crafting items was a necessary part of life for them. As a Modern Urban Young Woman I don't have to make anything, in fact I have gone months and years without picking up a needle or a skein of yarn. But somehow - sitting in a chair, watching my hands do something something skilled and neat - I feel connected to these people.